No. All bedding and towels are supplied. We also have playpens, high chairs and booster seats for the kids. We are now Vacation Home Rentals - privately owned Suites - and daily housekeeping is not provided. A mid-stay clean and towel/linen change is scheduled for those staying seven or more nights. Extra toiletries as needed are supplied. A gentle reminder: There will be an extra charge for towels and/or linens that are soiled beyond reuse after your visit. Are the kitchens ready for use or do I need to bring my own dishes? All suites have residential size ranges, refrigerators, freezers, microwaves and most have dishwashers. They are also equipped with toasters and drip coffee makers. Cutlery, dishes and glassware are supplied to maximum capacity of the suite. Pots and pans are provided and we also maintain a supply of larger stockpots, etc. We even provide dish detergent, dishwasher tabs, one complimentary 150 gram package of Voets Kaffee gourmet coffee and salt & pepper. A gentle reminder: If you perfer to leave your dirty dishes for housekeeping upon departure there will be a $100.00 + tax fee charged to the card on file. Yes, we are dog friendly. A $30.00 + tax charge for each of your furry family members will be added to your reservation. Maximum two dogs per Suite, excluding Suite 4 and 21 which have a NO dog policy. As one hotelier suggested, “If your dog can vouch for you, we’ll let you come along too”. We do ask that you accompany your dog and clean up after them, be with them in the Suites and Townhouses and be aware that dog are not allowed on the ski runs. Need doggie bags? Ask at the reception desk. Can we buy groceries at the Resort? * Do your shopping prior to leaving Vernon. * Visit The Lord Aberdeen Market which is a deli/liquor/convenience store located in the heart of Silver Star Village. * You can pre-order groceries through The Butcher Boys grocery store website www.butcherboys.ca/orders/. Do you have Internet access and Cable TV? Yes, the hotel has complimentary wireless modems in every Suite and Townhouse. Also, we have Shaw Cable TV. Are there spa services at the resort? How do I find the latest snow conditions and more information about Silver Star Mountain Resort? 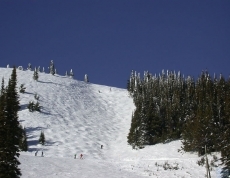 You can check Silver Star’s daily Snow Report. How do I get to The Pinnacles Suites at Silver Star Mountain Resort? * In Vernon, turn east from Highway 97 onto 48th Avenue, which becomes Silver Star Road as you leave the community. * Silver Star Road winds through rural countryside as it climbs to Silver Star Mountain. * As you enter the Resort, you will pass under two skier overpasses. * Pinnacles Road is the first left after the second overpass. * Drive ½ km up the hill until you reach a fork in the road - take the middle road which is the driveway to the Pinnacles. There is "Welcome Guest Reception" sign at the front door entry off the upper parking area. Where can I purchase ski tickets? Information on purchasing day tickets or discounted multi-day tickets is just a click away: Tickets/Silver Star Mountain Resort. There are private hot tubs on the decks of all Suites and Townhomes except for Suites 101 and 9. In the winter all hot tubs are filled and included in the nightly rate. In the summer only a few Suite Owners keep their hot tubs filled and included in the nightly rate. For those Suites and Townhomes that don't have the hot tub filled in the summer, the cost to fill it for your stay is $135.00 + GST. This option can be made at the time of booking.